It's time to create your own sequel to the Scream movies with this teen Ghost Face costume. 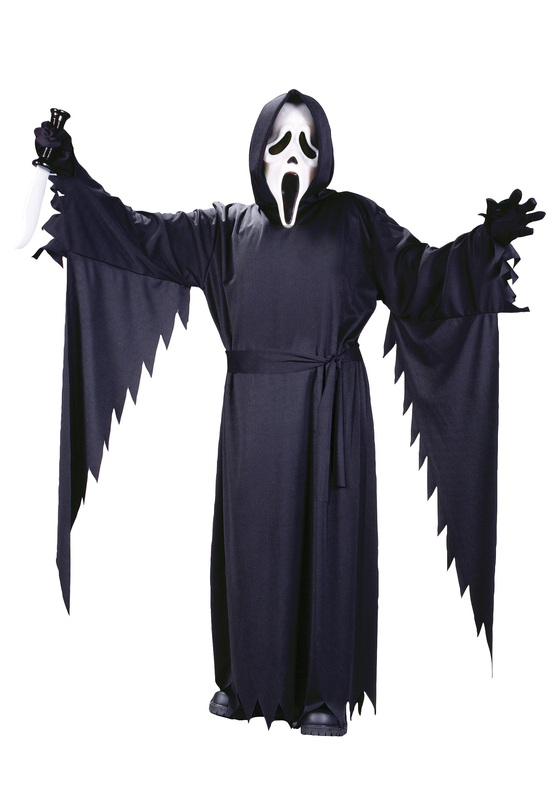 The licensed Scream costume includes a polyester robe that features a velcro clasp in the back for a secure fit. The hood, which features a foam lining around the edge for shape, slips on over the head to add an extra creepy appearance. Ragged trim covers the sleeve ends, as well as along the bottom edge of the robe. Each sleeve also has a ragged accent piece that drapes down from the forearm of the sleeve. A black polyester belt ties around the waist to finish the look. The costume also includes a vinyl mask. The mask features Ghost Face's frightening features, like a white sagging face and a screaming mouth. Black mesh in the eyes allows for vision and a slit near the mouth allows for comfortable breathing. It fits with an elastic band and also features a black draping cloth at the bottom to help blend into the robe. Add our toy bloody knife to your order and let the next string of killings begin!